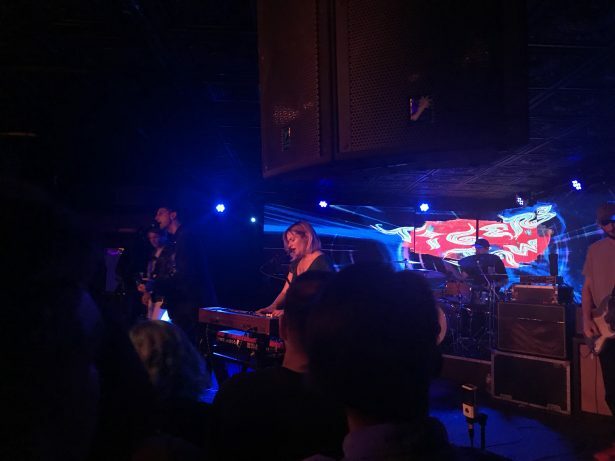 Four days into Tigers Jaw’s Winter tour with Yowler and Looming, the group found themselves back in Virginia Beach playing at Shaka’s for what vocalist/guitarist Ben Walsh said was the first time in years for the Scranton, PA-based band. Walking into Shaka’s for the first time in almost a year myself, I was instantly filled with nostalgia. Seeing all of my friends and being back in the venue that I had essentially grown up in brought a sense of excitement about the show and my surroundings. The nostalgia only intensified once it hit me that I was seeing a band I fell in love with when I was a sophomore in high school, in a venue that was essentially the birthplace of my love for the music I listen to on a daily basis. Looming was an interesting band to watch. I had heard about them before, but I never dedicated any time to listen to them. Being a woman bass player myself, I am always interested in a semi-successful band that is fronted by a woman bass player. 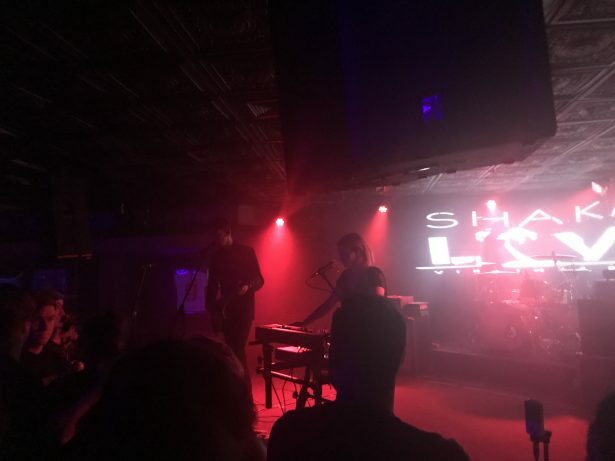 The second she started singing I was instantly reminded of Screaming Females, but that wasn’t a good thing — no one likes to hear a ripoff of their favorite band. Granted, Looming did have a few high points that had me moving around: however, I could not get over the idea that I was listening to an emo version of one of my favorite alternative bands. Yowler was good enough. Again, I always appreciate a woman-fronted band. My friends and I were sitting at the tables in Shaka’s during their set, and the music sort of faded into the background, but not in a negative way. It was calming and interesting while also not being too in your face. Imagine being in a coffee shop and talking with friends — you appreciate the atmosphere without having to spend too much time digesting it. Now don’t get me wrong, the music was still enjoyable. It was something I could appreciate, but I just could not get into it like I would have at one time. Unfortunately, that confusing feeling of disinterest and boredom only carried over to the headliner that I was originally so happy to see. When Tigers Jaw started their set, I was slightly confused. I felt like something was missing. Then they played “The Sun,” off of their self-titled first album, and what was missing became blatantly obvious. Some of the lyrics I resonated with most in my early teens were only so impactful because of the slow, deep, and tired sounding vocals of Adam McIlwee, the original founder of the group who wrote the majority of their first releases. McIlwee, now making music under the name Wicca Phase Springs Eternal, left the group after 2014’s Charmer. This left Walsh to pick up the pieces, and he just could not make that happen for me. With his high-pitched, whiny singing style replacing Adam’s missing vocals, it was hard to fully immerse myself in the set. The old material sounded like Tigers Jaw doing a cover of Tigers Jaw. I would find myself bouncing around and enjoying the music, but once I really listened to it, it just sounded wrong. The weirdest thing of all was the fact that there were teenagers there who only knew the recent release. The latest Tigers Jaw album, Spin, was so mediocre it was almost painful. But not to the new fans. They were almost experiencing a whole different band than the one I had grown up loving. These kids were jumping, yelling, and having a good time — until they played anything that Adam was involved with. During those earlier songs, the ones I felt the deepest connections with, it was a break for the new younger fans to take pictures, check their texts, do anything but hear songs they didn’t know. This show was a big eye-opener for me. It helped me realize that the bands that I love are changing, and while to some people it’s amazing, to others (including me), it just isn’t. I didn’t hate the show, but I did walk away from it slightly disappointed. 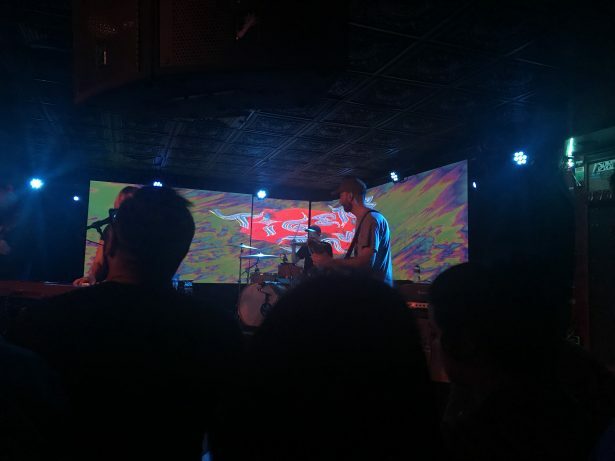 My first time seeing Tigers Jaw was supposed to be this special, nostalgic moment in my life, but it only served as an epiphany. I’m growing up, and some of the music I love will not come with me. For young people who are exploring different styles of music, I would recommend seeing the band as a perfect intro level band. For people who grew up loving their older stuff, though, you might as well save the $20.